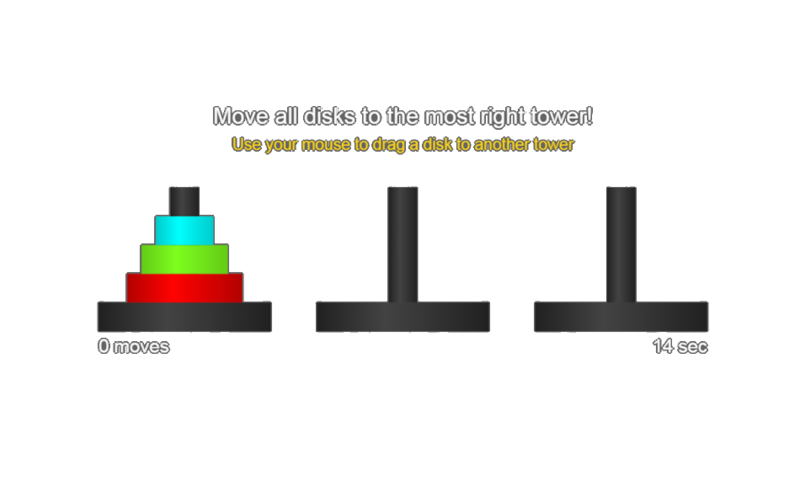 The Tower of Hanoi is a popular mathematical puzzle which requires players to find a strategy to move a pile o disks from one tower to another one while following certain constraints: Only the upper disk can be moved and no disk may be placed on top of a smaller disk. The game is frequently used in psychological research on problem solving, for example to study developmental progression in children and adolescents (Byrnes & Spitz, 1979). Since problem solving falls into the class of executive functions, the Tower of Hanoi task is also used in neuropsychology to assess cognitive deficits correlated with with frontal lobe activity or impairment (Yochim et al., 2009). The task is considered to be a non-insight problem that follows a means-end analysis approach (Gilhooly & Murphy, 2007). Learning effects seem to include a procedural memory component (Davis & Klebe, 2001). Byrnes, M. M. & Spitz, H.H. (1979). Developmental progression of performance on the Tower of Hanoi problem. Bulletin of the Psychonomic Society, Vol 14 (5), 379-381. Davis, HP, Klebe, KJ (2001). A longitudinal study of the performance of the elderly and the young on the Tower of Hanoi Puzzle and Rey Recall. Brain and Cognition, Vol 46, 95–99. Gilhooly, K.J & Murphy, P. (2007). Differentiating insight from non-insight problems, Thinking & Reasoning, 11:3, 279-302, DOI: 10.1080/13546780442000187. Yochim, B.P., Baldo, J.V., Kane, K.D., Delis, D.C. (2009). D-KEFS Tower Test performance in patients with lateral prefrontal cortex lesions: the importance of error monitoring. J Clin Exp Neuropsychol, 31(6), 658-63.